Snoozer Quinn was an early jazz banjoist and guitarist from Bogalusa, La., whose contemporaries were Eddie Lang and Lonnie Johnson. The golden years of his career, from 1925-1932, were mostly spent with territory dance bands touring throughout the South and Southwest, like the Paul English Traveling Shows, Peck’s Bad Boys, the St. Louis Rhythm Kings, the Louisiana Ramblers, the Mart Britt Orchestra, and Robert E. Lee and His Confederates. 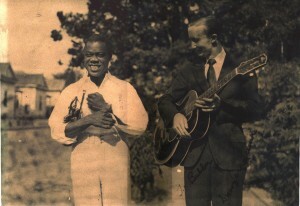 Snoozer also played with renowned musicians like Paul Whiteman, Louis Armstrong, the Dorsey brothers and many other leading musicians of the 1920s and 1930s. But he rejected the “big time” scene of New York in favor of staying in the South. Consequently, Snoozer is less well known than his peers, and certainly, he recorded less than his peers. Snoozer was working mostly before the era of amplification and the widespread acceptance of jazz guitar as a lead instrument. Solo recordings he made for Victor Records in 1928 were never released, and have been lost to time. Just think…. The solo recordings of one of the first and best jazz guitar soloists could be sitting in a vault somewhere, gathering dust. I am always searching. Snoozer had a wonderful life in terms of travel, adventure, good friends and people who loved him, but he did face many challenges. His head was slightly misshapen from birth, he suffered from alcoholism and tuberculosis, and he died too young, in 1949. He never married, was very shy and lived with family most of his life. Music was where he found his joy on earth, and he was amazing according to lore. He could play three parts – bass rhythm, melodic lead and harmony – on a guitar all at once, and shake your hand while doing so. Over time, I hope to share Snoozer’s story and his music with the world. My boyfriend is related to Snoozer Quinn, and about a 1 1/2 years ago he began researching his recordings. He has tried to find any memobilia from Snoozer or family pics, but most of his family has passed. Matthew’s grandmother knew Snoozer, but we haven’t been able to get much information on him because her health has rapidly declined in the last 2 years. We have very little information, and I saw a flyer in Bogalusa a few days ago advertising for thursday’s event at the U.S. Mint. We are so excited about Thursday night, and the chance to learn more about him. Katy, you have done a remarkable job of research on the great Snoozer Quinn. As you know, I got to know him when I was 11 or 12 years old; he would come to visit Pud Brown, a tenor sax man. and Bubba Broyles, owner of a popular Shreveport music store. Both lived on Dalzell St. Snoozer never went anywhere unless he was wearing a nice suit with a spiffy shirt and tie and shiny shoes. His guitar was always handy and he loved to play for his friends. Thank you Katy for all of your work. My father, E.C. Watkins was a friend of Snoozer. He told me a great deal about his memories of Quinn and his remarkable music. enough to to have known him personally. With a name like Quinn, he was obviously of Irish extraction (even his nickname sounds like something from Dublin!) What a pity he never got to play with any of the great Irish trad players like Michael Coleman or Paddy Killoran who began recording in NY in the 1920’s. The quality of the backup on the Irish records is generally very poor; a good solid player like Quinn or Eddie Lang would have added so much. I wrote a fantasy piece on the subject a few years back and would be happy to share the link with anyone interested. I would love the link!